Have you suffered serious injuries and personal injuries in an accident that wasn’t your fault? Catastrophic injuries can have a significant impact on a victim’s quality of life and can be physically and emotionally demanding for you and your family to deal with. 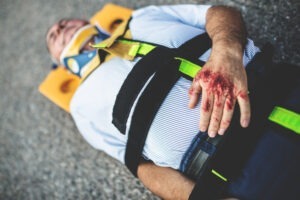 Being involved in an accident is upsetting and to suffer serious injuries can be life-changing. At DSM Legal Solicitors we understand the devastating impact a serious injury can have on a person’s life and have established an understanding of the difficulties facing you and your family. Call 01925 937070 to speak to one of our expert solicitors or complete our Serious Injury Personal Injury Enquiry Form by clicking here and a solicitor will contact you at a time convenient to you. Not only will one of our expert solicitors help you to recover the compensation you deserve, we have access to expert services such as physiotherapists and financial advisers who can help you to get your life back on track following a serious injury. For initial serious injury advice call us today and speak with one of our solicitors today or use our interactive personal injury compensation calculator to find out how much you could claim. Alternatively you can use our Personal Injury Enquiry Form by clicking here. Why should I choose DSM Legal Solicitors for my serious injury claim? Our office in Warrington, Cheshire is minutes away from Junction 8 of the M62. Please email info@dsmlegal.co.uk to make an appointment. Our office has free on-site parking and disabled access, including a lift. DSM Legal Solicitors can help those who have suffered from a serious accident receive the financial damages they deserve in order to pay for additional medical costs, rehabilitation and financial loss suffered as a result. We work with medical professionals to define the status of your injury and how it could be resolved, or what the long term prognosis will be. Arranging rehabilitation and immediate needs assessment will be one of the first things we do. Our lawyers will also ensure to help you access additional financial support as quickly as possible, especially if your suffering has left you unable to work. We have offices in Warrington and we have helped clients from across England and Wales. You can telephone one of our personal injury solicitors for a free, no obligation chat on 01925 937070 or complete our Serious Injury Claim Enquiry Form by clicking here. We can assist with personal injury claims (accident claims), medical negligence claims, criminal injury compensation claims, employment law claims, wills and probate, oaths, affidavits and statutory declarations, lasting powers of attorney, settlement agreements and professional negligence claims. Our team are more than happy to answer any questions you may have. You can also use our compensation calculator to find out how much your case could be worth.